Summary: After a great war, the East Pacific is in ruins. In brutal Neo Seoul, where status comes from success in combat, ex-gang member Lee Jaewon is a talented pilot rising in the ranks of the academy. Abandoned as a kid in the slums of Old Seoul by his rebel father, Jaewon desires only to escape his past and prove himself a loyal soldier of the Neo State. Pacific Rim meets Korean action dramas in this mind-blowing, New Visions Award-winning science fiction debut. Review: I knew I needed Rebel Seoul in my life the moment I heard it compared to mix of Pacific Rim and Korean dramas, and I was not disappointed. There were giant robots, fight scenes, complicated (and angsty) family relationships and (ex-)friendships, questionable loyalties, rebellions, and a lovely romance—basically, author Axie Oh delivered everything I had hoped for. Jaewon was an excellent narrator whose position in life gave him a unique look at his far-future society. His priorities (getting a decent military placement, using it to leverage himself out of the Old Seoul slums, and just plain surviving) gradually started to shift as he learned more about the Amaterasu Project. It isn’t that he lost his innocence so much as he began to understand that there was a broader world out there with people who were more complex than he originally thought. There were some wonderful moments throughout the book where Jaewon considered someone else’s point-of-view, which radically changed how he saw them. The world of Rebel Seoul is fascinating. It’s not so far into the future as to be unrecognizable, and the classic divide between the haves and have-nots that’s common in dystopian-ish worlds was there. But one of the things that Oh did well was that this brutal government is frequently just as awful to its elites as to its poor, and being rich or from an important family isn’t as good a shield as its frequently portrayed to be. (Hello, first test! And mandatory military service for everyone, though privilege and excellent scores could get you less dangerous positions.) We got just enough detail to have an idea of how this militaristic superstate formed, and I liked how much it felt like this was a society that had been at war for decades. That kind of society made a good contrast for drama among more intimate relationships, like classmates, friends, neighbors, and romantic partners. I have a weakness for “forbidden” romance, so Jaewon and Tera’s budding relationship was a delight. My favorite parts about it where how it developed out of time spent together and Jaewon’s empathy. He could have kept his distance—should have kept his distance from a girl raised and experimented on to become a weapon—but his empathy made him view her as a person first, not a tool for the exclusive use of his government. These two have become one of my favorite battle couples in YA. 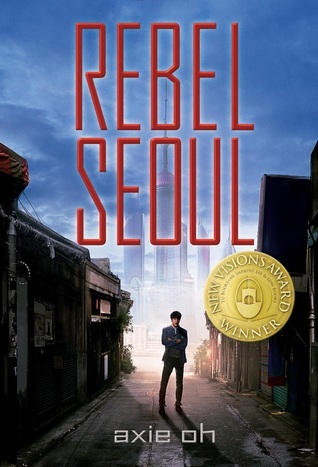 There were a few plot twists that I felt were too easily predicted and a few characters I wish had been fleshed out, but overall Rebel Seoul was one of my favorite reads this year. It is a book set in a messy, complicated world without easy answers or neat resolutions, and I loved it. Recommendation: Buy (pre-order!) it now. Axie Oh’s debut novel is a phenomenal mix of science fiction and romance set against a militaristic dystopian society. Rebel Seoul’s compelling characters and fast-paced plot means that this will almost definitely be on my year-end best-of list.